A marsquake is a quake which, much like an earthquake, would be a shaking of the surface or interior of the planet Mars as a result of the sudden release of energy in the planet's interior, such as the result of plate tectonics, which most quakes on Earth originate from, or possibly from hotspots such as Olympus Mons or the Tharsis Montes. The detection and analysis of marsquakes could be informative to probing the interior structure of Mars, as well as identifying whether any of Mars's many volcanoes continue to be volcanically active or not. The 4,000 kilometres (2,500 miles) long canyon system, Valles Marineris, has been suggested to be the remnant of an ancient Martian strike-slip fault. However, even if it was at some point an active fault, it is unknown whether the fault is still active, or if it has "frozen" into place. The first attempts to detect seismic activity on Mars was with the Viking program in 1975, and although the landers were operated for several years, the seismographs were mounted on top of the landers and were unable to detect any clear seismic activity, the Martian wind blowing them too much. It was possible to rule out frequent and large marsquakes at that time. The Viking 2 device collected data for 2100 hours (89 days) of data over 560 sols of lander runtime. The Viking 1 lander did not return any data due to a problem activating the seismometer. 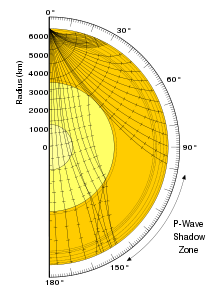 Times when the windspeed was low at the Viking 2 site, allowed limits to be placed on seismic activity at the time and place on Mars. There was one candidate for a Mars quake on Sol 80 by the Viking 2 seismometer. However, there was no wind speed data, so it's not possible to say whether it was the wind or not. Much of data set has been converted to ASCII files from the original recordings. Thirty years later, data from the InSight mission led to an increased interest in the Viking data set, and further analysis may reveal one of the largest collection of Mars dust devil detections. The InSight Mars lander, launched in May 2018, landed on Mars on 26 November 2018 and deployed a seismometer called Seismic Experiment for Interior Structure (SEIS) on 19 December 2018 to search for marsquakes and analyze Mars's internal structure. Even if no seismic events are detected, the seismometer is expected to be sensitive enough to detect possibly several dozen meteors causing airbursts in Mars's atmosphere per year, as well as meteorite impacts. It will also investigate how the Martian crust and mantle respond to the effects of meteorite impacts, which gives clues to the planet's inner structure. A faint seismic signal, believed to be a small Marsquake, was measured and recorded by the InSight lander on 6 April 2019. 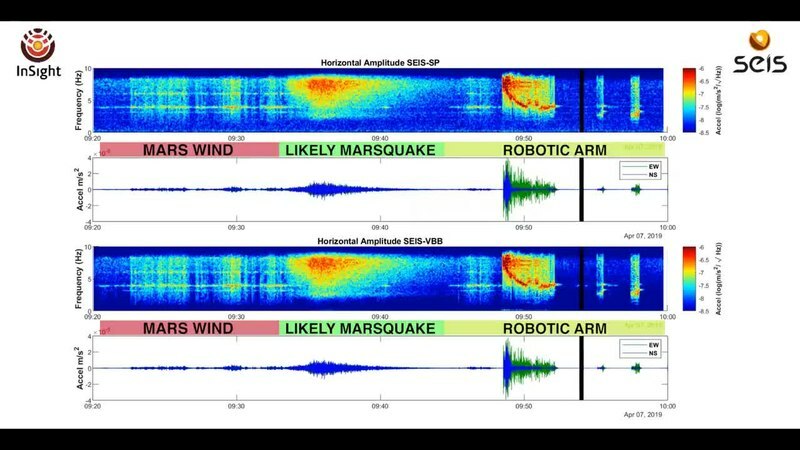 The lander's seismometer detected ground vibrations while three distinct kinds of sounds were recorded, according to NASA. Three other events were recorded on 14 March, 10 April, and 11 April, but these signals were even smaller and more ambiguous in origin, making it difficult to determine their cause. Despite the drawbacks of significant wind interference, on Sol 80 of the Viking 2 lander's mission (roughly November 23, 1976), the on-board seismometer detected an unusual acceleration event during a period of relatively low wind speed. Based on the features of the signal and assuming Mars's crust behaves similar to Earth's crust near the lander's testing site in Southern California, the event was estimated to have a magnitude of 2.7[clarification needed] and a distance of roughly 110 kilometers. However, the wind speed was only measured 20 minutes previously, and 45 minutes after, at 2.6 and 3.6 meters per second, respectively. While a sudden wind gust of 16 m/s would have been required to produce the event, it cannot be completely ruled out. ^ "Mars Surface Made of Shifting Plates Like Earth, Study Suggests". Space.com. Space.com. 14 August 2012. Retrieved 21 November 2018. ^ Yin, A. (4 June 2012). "Structural analysis of the Valles Marineris fault zone: Possible evidence for large-scale strike-slip faulting on Mars". Lithosphere. 4 (4): 286–330. doi:10.1130/L192.1. Retrieved 21 November 2018. ^ Greicius, Tony (28 March 2018). "'Marsquakes' Could Shake Up Planetary Science". NASA. NASA. Jet Propulsion Laboratory. Retrieved 21 November 2018. ^ a b c d e f Lorenz, Ralph D.; Nakamura, Yosio (2013). "Viking Seismometer Record: Data Restoration and Dust Devil Search" (PDF). 44th Lunar and Planetary Science Conference (2013). Retrieved 2019-04-24. ^ Stevanović, J.; Teanby, N. A.; Wookey, J.; Selby, N.; Daubar, I. J.; Vaubaillon, J.; Garcia, R. (9 January 2017). "Bolide Airbursts as a Seismic Source for the 2018 Mars InSight Mission". Space Science Reviews. 211 (1–4): 525–545. doi:10.1007/s11214-016-0327-3. Retrieved 21 November 2018. ^ "NASA and French Space Agency Sign Agreement for Mars Mission" (Press release). NASA. 10 February 2014. Retrieved 11 February 2014. ^ Boyle, Rebecca (4 June 2015). "Listening to meteorites hitting Mars will tell us what's inside". New Scientist. Retrieved 5 June 2015. ^ Kumar, Sunil (1 September 2006). Design and development of a silicon micro-seismometer (PDF) (Ph.D.). Imperial College London. Retrieved 15 July 2015. ^ Witze, Alexandra (24 April 2019). "First "Marsquake" Detected on Red Planet". Scientific American. Retrieved 25 April 2019. ^ Brown, Dwayne; Johnson, Alana; Good, Andrew (23 April 2019). "NASA's InSight Detects First Likely 'Quake' on Mars". NASA. Retrieved 23 April 2019. ^ Bartels, Meghan (23 April 2019). "Marsquake! NASA's InSight Lander Feels Its 1st Red Planet Tremor". Space.com. Retrieved 23 April 2019. ^ Lorenz, Ralph D.; Nakamura, Yosio; Murphy, James R. (November 2017). "Viking-2 Seismometer Measurements on Mars: PDS Data Archive and Meteorological Applications". Earth and Space Science. 4 (11): 681–688. doi:10.1002/2017ea000306. ISSN 2333-5084.